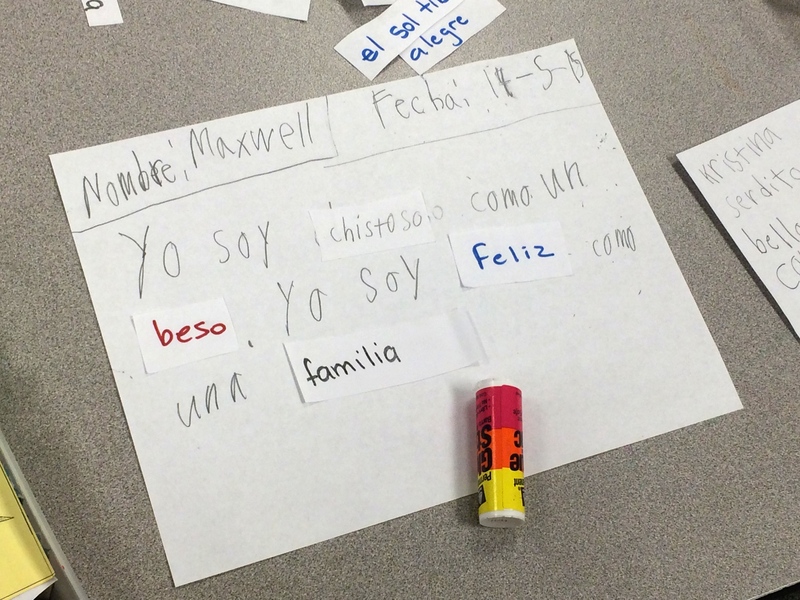 Welcome to Spanish Immersion Through the Arts! 1. 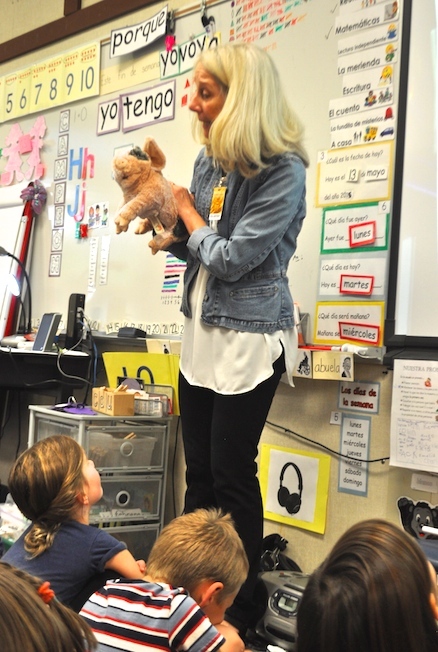 To enrich the immersion setting by providing opportunities where students can “play” with the Spanish language through literary, visual, and musical experiences. We aim to give our students freedom to (a) experiment with spoken Spanish, (b) refine their comprehension (“fine-tune their ears”), and (c) incorporate their new skills into the written and analytical areas of learning. 2. To provide unique cultural experiences not easily found in our community. 3. 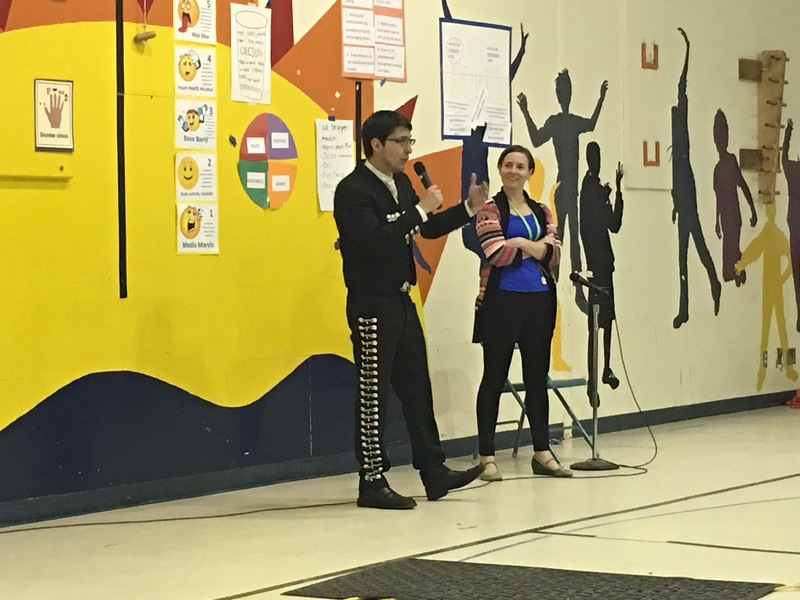 To establish long-lasting connections between Puesta del Sol and Seattle’s growing Spanish-speaking community of artists and educators. 4. 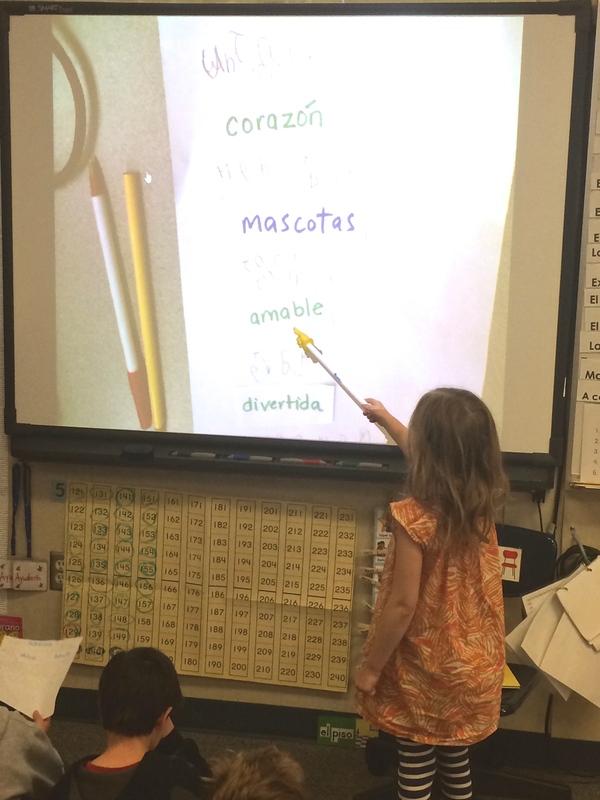 To lead through example in a community-wide campaign to meet the immersion needs of our Spanish immersion setting. UNITY SCHOOL WIDE ART PROJECT - Our big SITA project was based on the work of Mexican mural artists Pedro Linares and Rodolfo. It was a collaborative project around the theme of UNITY in our school, our community and our world. We were lucky to welcome Adriana Morales back, a local Mexican artist. WRITERS IN THE SCHOOLS - We partnered with SEATTLE ARTS AND LECTURES (SAL) to provide poetry workshops for 4th and 5th grade students. The workshops were two weeks long and students got to learn how to find their own literary voice to write an original poem in Spanish. Some of the best pieces were later published as part of the Writers In The Schools yearly anthology. 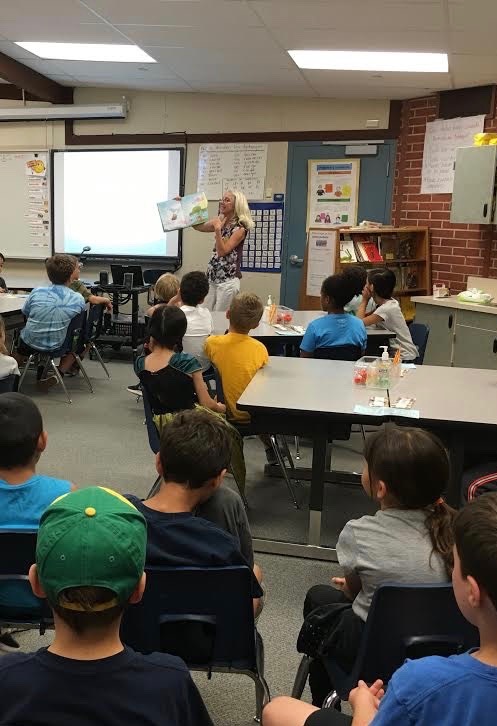 WRITING WORKSHOP WITH ARTIST MARIA VICTORIA - 1st, 2nd and 3rd grade students had a series of workshops in which they learn how to plan and create a simple "diamond" poem. The workshops were interactive and fun! FLAMENCO ASSEMBLY - Students got the opportunity to learn about the history of Flamenco, techniques and music in a wonderful interactive assembly brought to us by local and nationally recognized flamenco artists. It was a great honor and privilege in 2014 to have international renowned musician Carlos Nuñez introduce our students to the traditional bagpipe music of Galicia, Spain. He gave a lecture about his background and the various instruments he plays - traditional Galician bagpipe, Galician flute, ocarina, Irish flute, whistle, and low whistle. He gave an assembly for the whole school on September 22, 2014. The whole school was engaged with his performance. 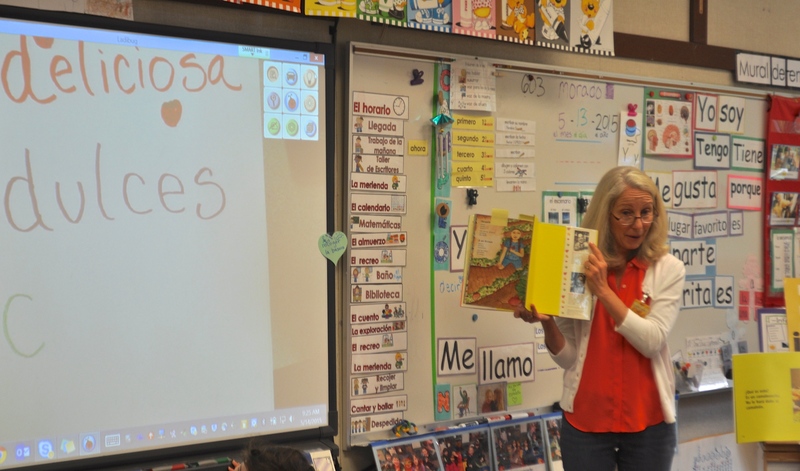 2015-2016: National Hispanic Heritage Month Celebration in September/October 2015 - Spanish readings were done by local authors and Puesta del Sol students, accompanied by Spanish songs of Marco Cortés. 2016: Seattle Opera performed Cinderella en España for all of our students. We were delighted to welcome back Marco Cortes to Puesta del Sol during the months of November and December. El Sr. Cortes is a Chilean born musician that has focused his career on teaching music to children in Spanish. Sr. Marcos' workshop was for students in grades K-2 and he had the chance to visit each classroom twice. The children composed songs with him that related to what they were learning in their classrooms. For example, our Kindergarten classes learned some of his songs. The first graders composed songs using the new vocabulary words they were learning. The second grade class composed the Puesta del Sol song, that with the help of Señora Rose has become the school song! Marco is a fabulous musician and educator and we were very fortunate to have him at Puesta. He has many CD’s out and his songs are a big hit with the younger students. Marco came back in the Spring and delighted us with his music at both assemblies. He did some sing-alongs with the younger students, and marimba players from Sra. 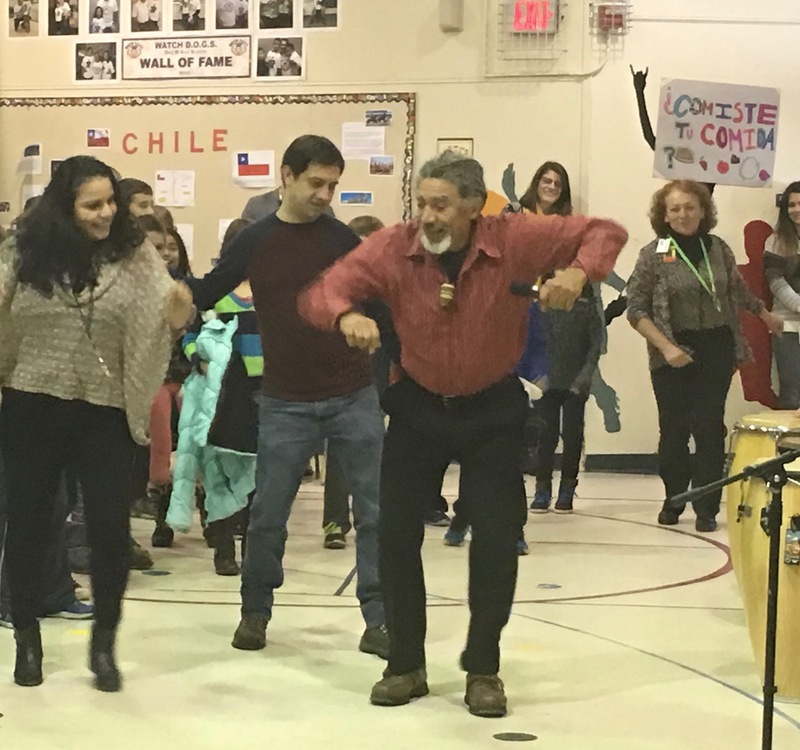 Rose’s class joined him for the 3-5 grade assembly, where he also showcased some of his favorite music from Chile. 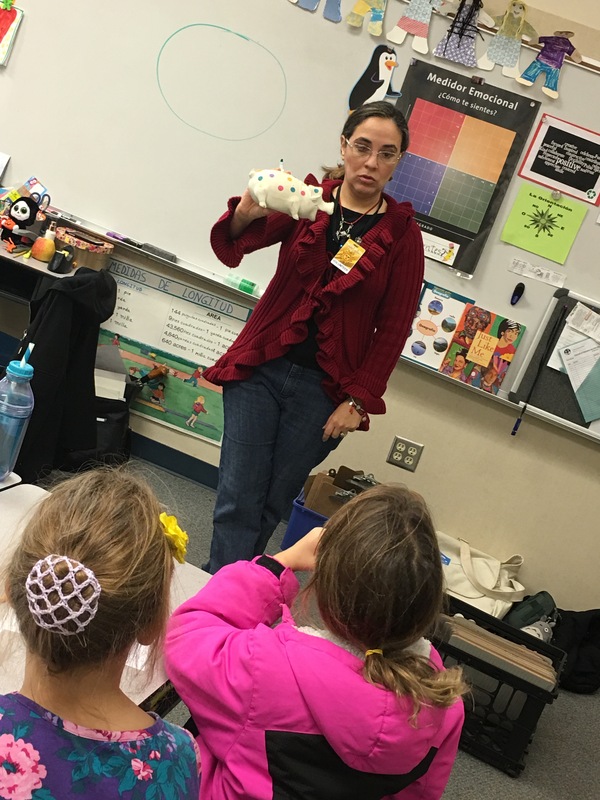 Mexican artist Adriana Morales visited 3rd grade for a class on illustration, specifically character creation. They were studying character development in their literacy class, so this tied in perfectly to the curriculum. Students were invited to share their creations at the end. 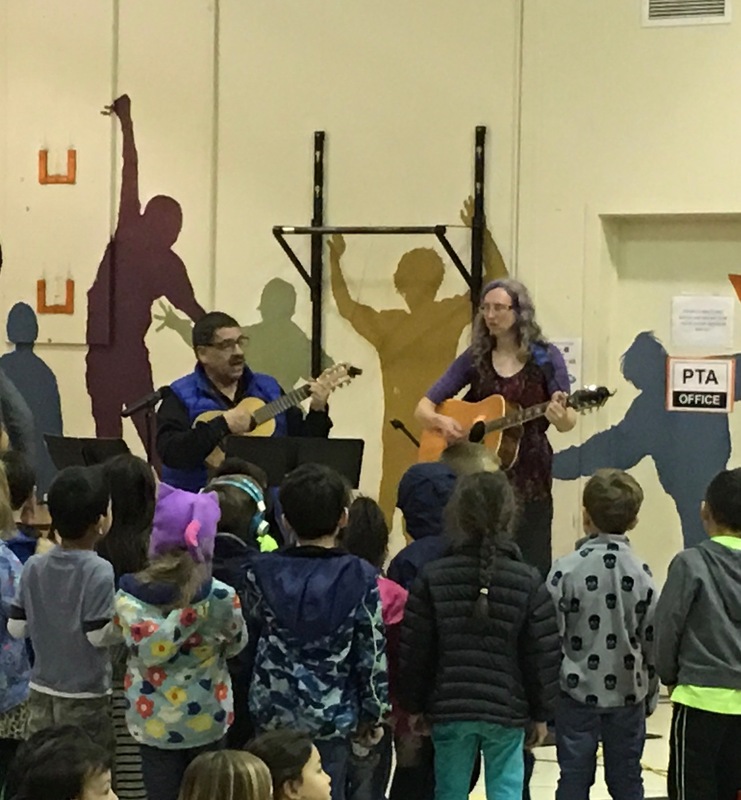 We had the pleasure of having a musical assembly with the Tambores teacher, Maestro Ricardo Guity and a special musical guest that was here from Florida, Maestro Angel Reyes. 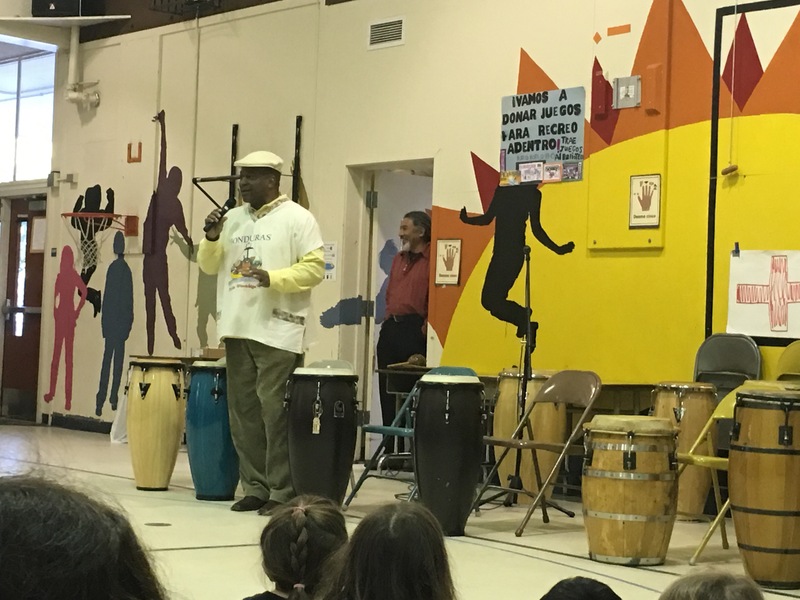 Together, the talked to the school about Bomba,the music coming from Puerto Rico, and tied it in with the Tambores music. The upper grade students invited the children that participate in the Tambores class after school to participate in the assembly. It was fun, festive, inter-active and engaging! It was so fun, even the teachers got up to dance! 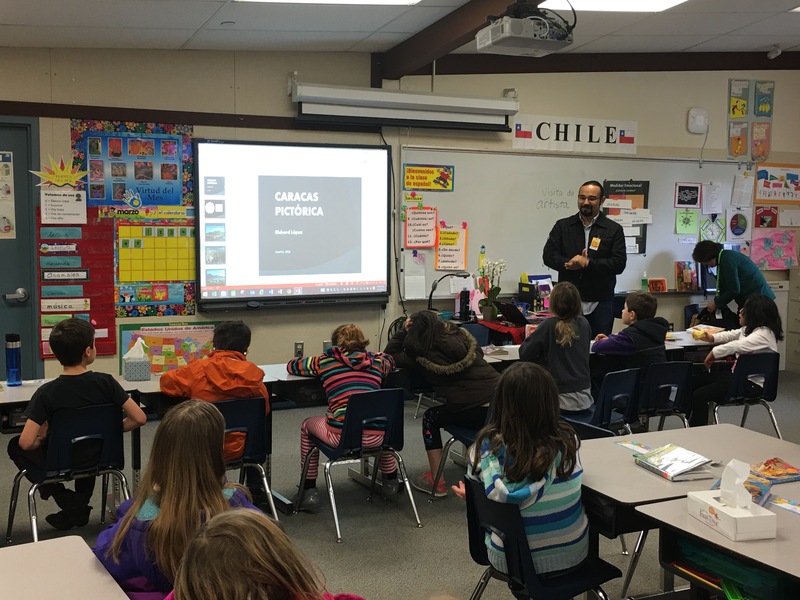 Richard Lopez, a Venezuelan painter came to talk to the third graders about his painting process, his visual arts career and about his job at the Arts Library in Caracas and how the library system is so different in both countries. It was very interesting, the children had lots of interesting questions for him. 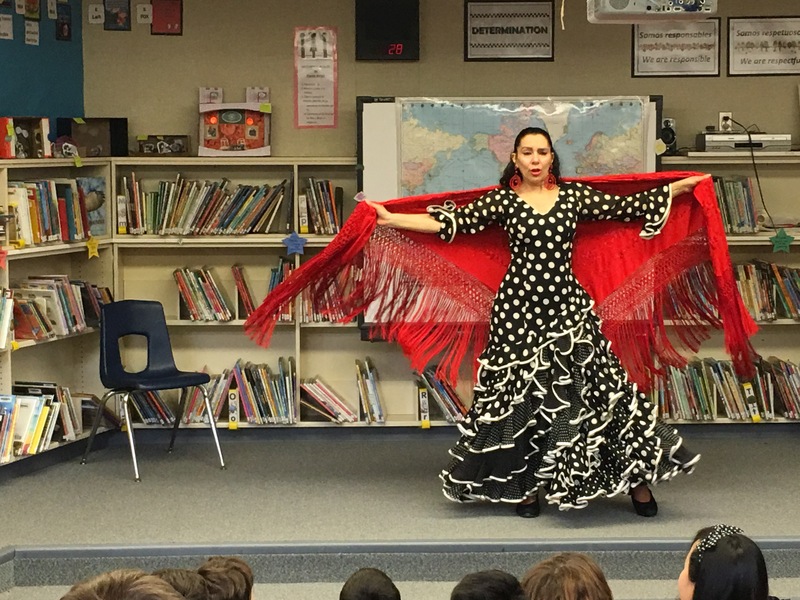 Also in March, our fourth grade students had the opportunity to watch Ana Montes, voted Best Flamenco Dancer over 30 in Seattle. Ana talked to the students about the history of Flamenco, the instruments used in the dance, the costume, the shoes, some moves and even some chants! She even danced on the tables so that the students could hear and appreciate her “taconeo”, which is the movement done with the feet, using the special Flamenco shoes. Ole! We have invited her to teach a Flamenco class after school. The third graders had the opportunity to welcome back Mexican artist, Adriana Morales for a three-week project. 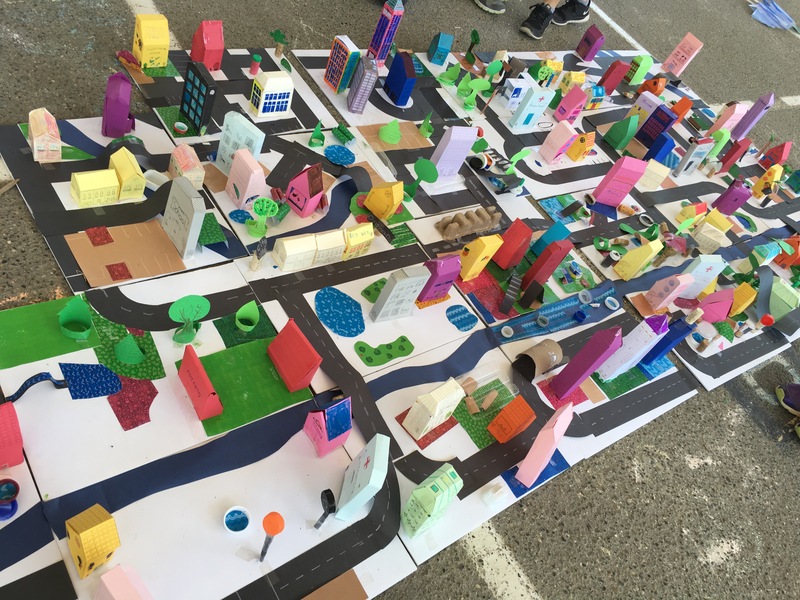 The project was all about urbanism and developing a city from scratch. It was fascinating to watch all the discussions, thought processes, bartering, disagreements, agreements, and compromising that went on throughout the process. The students were able to work in small groups and understood better what the whole urbanism concept is all about. This project tied into their Social Studies curriculum. 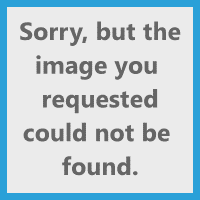 In May we had another amazing assembly, this time we invited Daniel Kapellmann. He is a Fulbright Scholar from Mexico that is a technology major but has a passion for music. As a young boy he learned how to sing “rancheras” and has won several contests and has done a multitude of concerts. He delighted us with his music, and invited some of the teachers to sing along with him. We had the honor and pleasure of having the Mexican author Maria de Lourdes Victoria for a two-week poetry workshop at Puesta. She was here last year, and we were very lucky to have her back again. Maria worked with grades 1-5, for a total of 20 workshops. The workshop was focused on Poetry and the theme was “water”. All of the students had fun and were very creative. They especially enjoyed sharing their work with the class. Some of these poems, were selected for a poetry reading at the Bellevue Library, to be held on October 8th, to celebrate National Hispanic Heritage month. Students were also encouraged to submit their poems to a second contest, which is Poetry on Buses. To participate in this upcoming contest, students can use the poem they wrote during the workshop, or create their own. The theme again is "water", 50 words maximum. More details about this contest are listed above in our Upcoming Events section. The poems from the finalists as well as all of the chosen poems will be compiled into a book and will be at the library for everyone to enjoy.